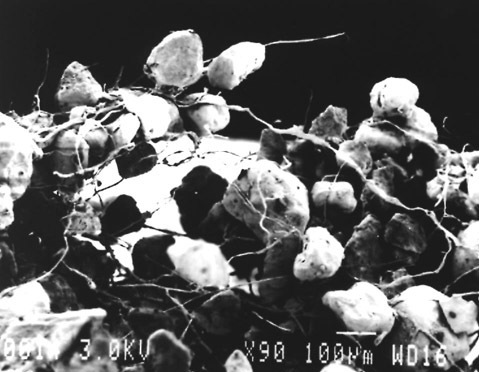 Earth's Internet & Natural Networking: Biological Soil Crusts: What Are They and Why Should I Care ? This second video is only 46 seconds in length, but there is one sentence at the beginning of this clip that stands out where Dr Mike is speaking of what the mycorrhizal fungi can do for soil, especially sand grained soils. Pay close attention. Play over and over if you have to. "The Mycorrhizal Fungi produce a sticky glue like substance that will take Sand Grains and bunch them together into stable agregates that allow for the better movement of air and water into the soil." "In many ecosystems of the world's biological soil crusts play an important role for ecosystem processes. These biological crusts (also called microbiotic, microphytic or cryptogamic crusts) are assemblages of cyanobacteria, green algae, mosses, liverworts, fungi and/or lichens. BSC are highly stress tolerant under extreme environmental conditions and therefore widespread in many ecosystems from the deserts to polar regions. 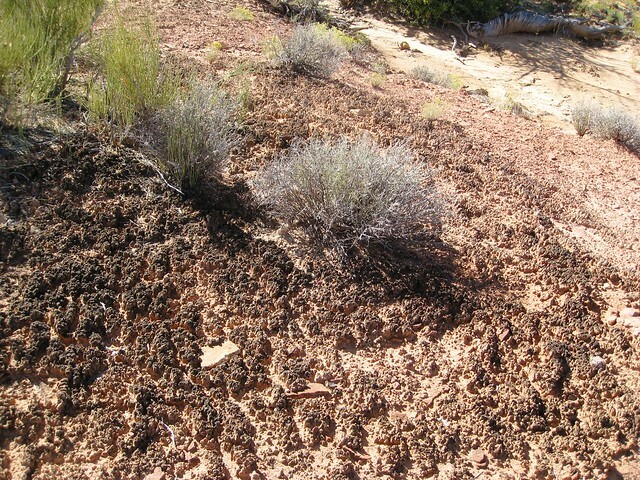 The biological soil crusts decrease infiltration rates and, thus, run-off could be observed even in a sandy area when covered by a biological crust. In addition to the influence on the hydrological conditions, the biological crust also stabilises the topsoil, reduces soil erosion, and enhances the nitrogen pools by nitrogen fixation. The understanding of pattern formations and interactions with biogeochemical and biotic processes are important for ecological theory and for applications in restoration ecology and combating desertification"
It's incredible, but as stated in the Introductory by Dr Maik Veste, these Biological Earth Crusts are not made up by just one organism, but a collection of an assemblage of symbiotic organisms which have formed a cooperative extension of sorts which seeks not to out compete each other but rather cooperate for the survival benefit of each other. They are basically 'cyanobacteria, green algae, mosses, liverworts, fungi and/or Lichens'. These crusts, a tightly bound mesh of various cyanobacteria, Lichens, Mosses, and Fungi, hold the soil down, prevent soil erosion, and may even provide a hospitable environment for germinating plants. 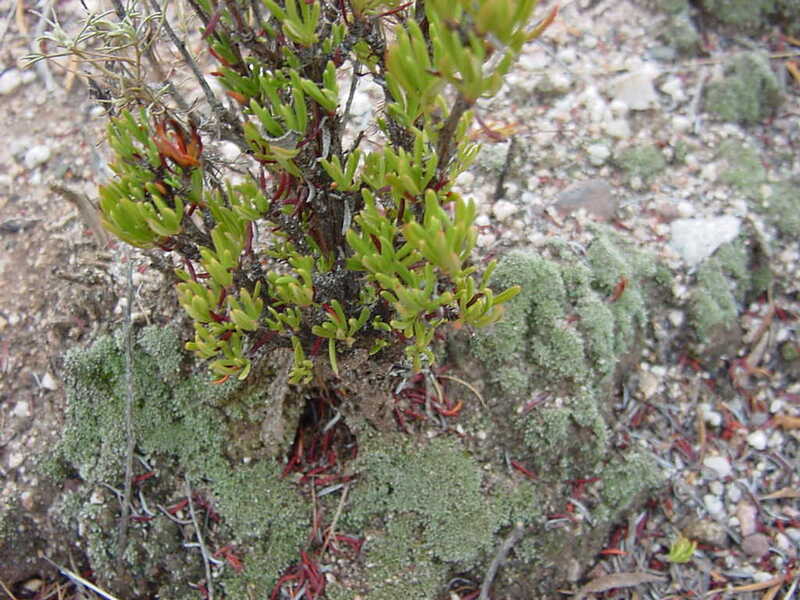 They were most likely the first land-based plant communities to appear on Earth to help prepare the soil for the other successions of plant life which came afterwards. "Mycorrhizal Symbiosis is not some mindless competition and 'Survival of the Fittest' game, but rather what we see is in fact they're interacting with each other trying to help each other survive." 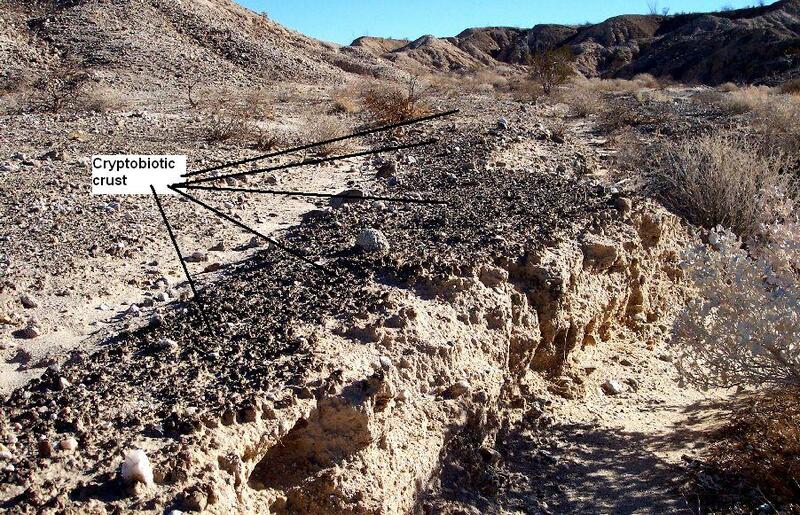 These Biological Soil Crusts are very common throughout the deserts southwest in the United States where many folks most likely have seen them but probably walked all over them not realizing the vast potential role these play in that Desert Ecology's soil stabilization. 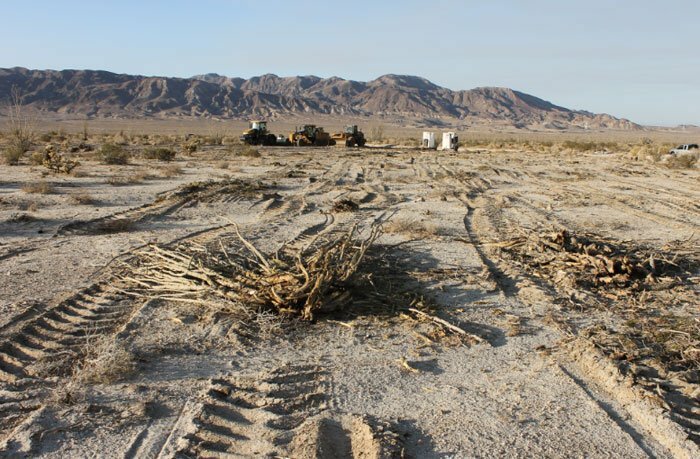 This is why in some places in the past Off Road Vehicle Restrictions use have been enforced through various laws and other rules by the Bureau of Land Management or Anza Borrego Park Authorities to the irritation of many opponents who resent the restrictions and feel their behavior in no way impacts what they considered no more than dirt that blows around in the next wind storm and repairs itself quickly. Well, that's what excessive amounts of Beer which dehydrating the body will do to one's thinking and reasoning ability in the Sun & Heat of high noon, but let's take a look at these photos anyway. This first photo should help you visualize what Dr Mike Amaranthus was speaking about in his educational video. Now here are much larger wide angle views of what we're talking about on the surface, which you have most likely seen but never realized their importance or even existence before. Now I know half you people out there have seen these features in the high & low deserts before, you just never gave it a second thought. Hopefully your appreciation has been deepened as you find out just exactly how important and complex these bits of hardware are to our desert environs and the respect they should be accorded. Well now of course those were the desert habitats, but what about other areas ? Are biological crusts found in and around other various ecosystems as well ? You bet they are and let me give you one prime example of one unique interior valley foothill system which greatly supports all those wonderful beautifully green high mountain forest systems that most people seem to prefer. I truly hope that after this very new revelation to most, you'll walk away with a far deeper heartfelt appreciation for an ecosystem that is mostly ignored as having very little value, even though it is a very much foundational one. I'll make this system's importance real easy for anyone to verify. These next three pictures below are for folks who live out in the Riverside County California region. These are pictures of State Highway 74 driving up from Hemet California to Idyllwild California. I'm wanting to focus particular attention to the Chamise or Greasewood (Adenostoma fasciculatum) chaparral community type habitat which exists on those southern facing slopes you observe especially above the north side of the highway as you head east on those south facing steep slopes. This poor shrub is demonized and undervalued as having little or no worth. It's something to be removed and replaced by more "Eye Candy" appealing shrubs. It's often criticized as being invasive and taking over desirable habits. But most often these remarks are based on an individuals own ignorance of the foundational importance of this plant community to all other attached ecosystems it is interconnected with. Take a look here at what most people see. Adenostoma fasticulatum is another example of no respect and yet it is potentially one of the greatests assets in waiting patiently for climate circumstances to change and allow forest pioneer trees to invade and succeed in spreading the tree habitat as they later yield. 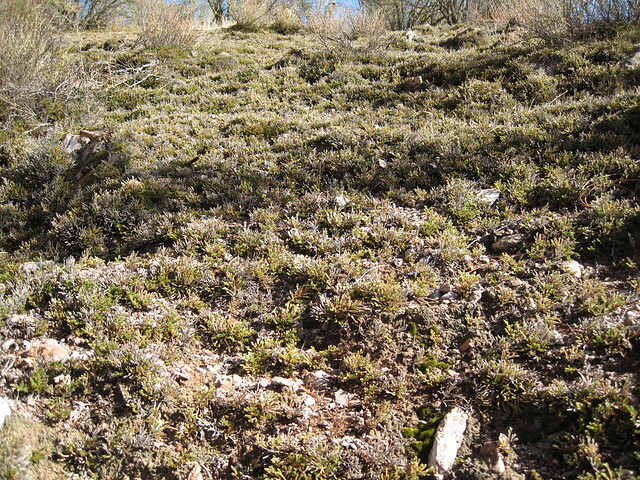 Adenostoma fasciculatum (chamise or greasewood): Worthless Brush or potential Nurse Plant ??? Yup, sure enough, that's the culprit. Dry nasty, stickery and jagged looking. Why you can't even hike through that stuff without tearing up your clothes and cutting or scraping your own skin. Worthless and aesthetically unappealing. It's ONLY a fire hazard. Once established it just seems to take over and nothing else can grow there. Is all of this really true ? ? Well in a word - NO! 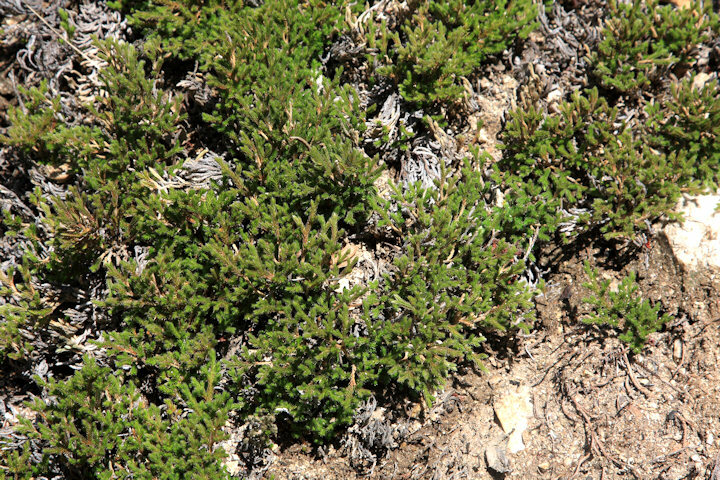 It's certainly true that this shrub is one tough cookie. It tolerates drought and nasty dry conditions better than most any other shrub out there and I must honestly & admiringly state here it can & will grow where no other shrub is able. Given the right conditions however, it's the other shrubs which will invade this plant's territory by naturally moving it out, not the other way around. It's ability to stabilize slopes and other weak geological soil conditions is absolutely amazing. Now on that drive up on State Highway 74 from Hemet to Idyllwild, you really need to notice the lack of any real stable bedrock in the geology of all those foothills. You can observe this from all the road cuts. Broken fractured rock mixed with decomposed granite and sand does not make for stability if plants are absent. Look at many of the weaker California coastlines and their landslide history which is exacerbated by human activity immersed in ignorance. 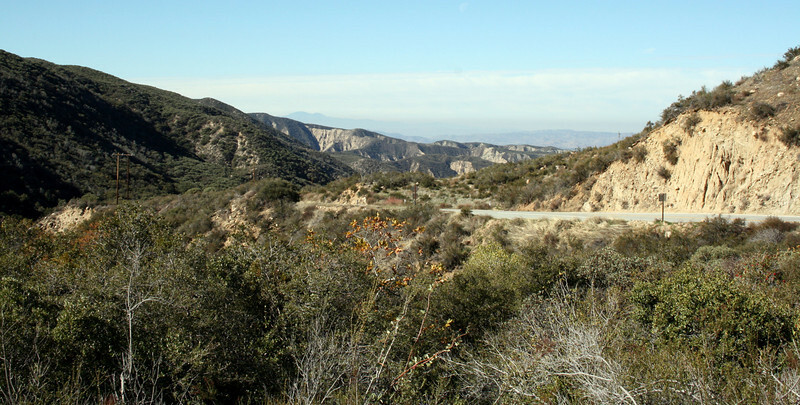 You will see identical landslide history on the way up this San Jacinto River Canyon in these lower San Jacinto Mountains foothills areas. Actually this plant has some very remarkable qualities. Here are some pertinent facts. Did you know that it's roots system is extremely extensive and by volume out competes even it's own above ground canopy ? Did you know that it's roots are usually deeply penetrating, multiple branched taps roots and wide spreading lateral roots? These multiple branching tap roots can dig down deep into the soil to some 10-12 feet under ground or even more. It also has a growth phenomena of it's lateral roots and branches which sprout and grow out from what is called a Lignotuber , which means it has a starchy swelling of the root crown as a protection against destructive wildfires. This crown contains buds which almost immediately sprout back after a fire and survives as a result of the starchy nutrient stores in its base which will support this growth in the absence of photosynthesis and until the next seasons rains come in. Take an example view of a Lignotuber and appreciate this incredible piece of Earth Internet Hardware. Okay, so what does all of this have to do with Earth's Internet blog and this post's subject matter about Biological Soil Crusts ? 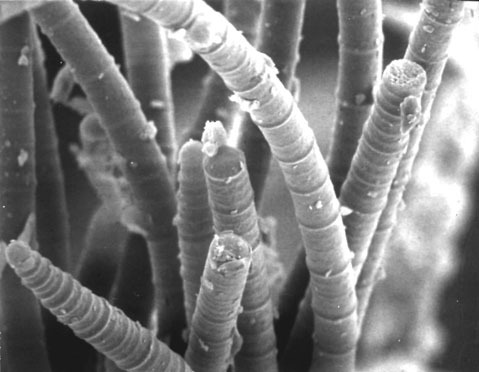 Simple, this plant as other plants and or all various forms of mycorrhizal fungi referenced on this blog are perfect examples of Earth Internet Hardware. And that's all they are is Hardware. However it's the genetic material that is the software which programs, controls and drives the machinery to work in perfect harmony when allowed to do it's job correctly. Human interference and ignorance as common Layman have been the only problem for this incredible biological machinery. Understanding these networks and consulting a virtual owners manual is the only way to properly understand and work with these mechanisms for the benefit of our planet's health. There is an incredible variety of a Lichen/Moss Bio-Crustal combo habitat type that grows in horizontal terraced like patterns around or intermingled with these individual Chamise trunks & roots systems. Hence they form a mutualistic symbiotic relationship with one another in holding these foundation foothill topsoil together. They tend to grow horizontally in a sort of terracing pattern on these slopes. These moss/lichen combos are only a couple of inches high and I have never found very much info on them other than way back in the early 1980s while listening to some special firemen called Hotshots speaking about this plant as they were cursing it's tough ability to stay put when they were trying to make fire breaks to stop the approach of an oncoming brushfire. First off, below here are some photos of the drive from Hemet to Idyllwild CA. This will give you a reference area. Below here are some photos of various Bigelow's Spike Mosses Selaginella bigelovii which are part of this important habitat along with Lichen associations intermingled with one another. This plant reproduction and spread are fascinating as well. It doesn't necessarily spread by seeds or spores so much as it spreads through underground Rhizomes into newer territories. Clearly this also qualifies it an an important internet component to be utilized in any habitat restoration project. This Spike Moss - Chamise combo allow every raindrop to slow way down and filter or percolate into the soil. If the soil is saturated, then it's simply acts to slow this movement down. Any of those hills I saw during the rainy season showed water trickling down normally dry washes in a crystal clear form. Never did I observe silt or any other debris. Only in human disturbed areas would you see this. Here is a prime example of some human ignorance and stupidity that was done along time ago (literally decades) and I have to assume it was done when California State Hwy 74 was first constructed so many years ago. As you drive east from Hemet and you pass over Strawberry Creek, then two miles past that the road turns west and begins to take a steeper upwards climb before once again u-turning towards the east towards Idyllwild. It's straight for about a mile or so and then twists it's way up to a turn-off which is used by Cal-Trans Highway Maintenance Crews who store road gravel in large Bins or Bunkers on a rather large turnout area. This is also the location for hikers to park their cars and take a hike on what is called the South Fork Trail. This trail leads to the river canyon views of the south fork of the San Jacinto River which itself comes out from the Lake Hemet Dam which is way further up that valley. Now across from this turnout on the opposite side of that same highway you will see an Arroyo or Creek area where poking up out of all that Chaparral are some prime examples of large Coulter Pines and California Sycamores. This is odd because I always wondered while driving countless trips up and down that mountain when I lived up there and commuted to work that how odd it was that such trees would appear here for no natural apparent reason. What was the seed source I wondered ? Obviously this tiny Arroyo which the road crosses over a few hundred feet past the Cal-Trans turnout must have it's original source from the Baldy Mountain area which is (or was) heavily forested. I was correct, it did come from that source. I always noticed however that during heavy rain periods in winter there was never a dramatic flow of water, there was some, but not the kind that would wash seeds down from that huge mountain and not enough to support California Sycamores which are a water loving tree in this region. So what gives ? One day my curiosity got the better of me. It was still springtime in 1983 and I parked my truck and left it at the turnout area. I walked over to where the road had a very small culvert over this rather large Arroyo. I hiked up this small narrow gorge that cut through the rocky granite boulder bed-rock hills above the Hwy 74 and came out on the other side and sure enough the source for that former water course and seed base was from the Baldy Mountain wilderness area. But the water no longer went this direction. Why ????? Well I saw why! When the road construction was done, they had taken heavy machinery up here most likely by way of that South Fork Hiking Trail and deepened the creek channel and straightened channel and lowered it deeper than the original creek to divert the creek's water directly west instead of the natural land flow which went north towards and under the State Route 74. So no longer does water flow through it's natural water course that nature carved out, but now it drops off rather abruptly into the South Fork river basin. The consequence of this diliberate stupid ignoramous act is that an entire face of that section of the mountain which cannot be seen from the highway at all, has caused a giant landslide for which there is no control for which to correct it. An entire west flank of this valley just drops straight off into a deep abyss straight down to the canyon bottom. I know because I followed this channel full of swift running water to the water fall that was eroding the soft fractured cliff face. It's a radically dangerous place to be and no doubt collaspes further everytime heavy rains come. To give you an idea of scale, this area of Earth geology which collapsed into oblivion is probable the size of Rattlesnake Mountain in El Cajon which I have previously written about on my other blog. There that much of a mountain collapse that is truthfully hidden from view. I was just sick when I saw it. Okay getting back to the O.P. of this post. The point is that this geology is tightly held together by this amazing Chamise-Bigelow Spike Moss bio-crustal connection. Removal of it or diliberate destruction can have catastrophic consequences. I figure there were most likely two possible explanations and Parties involved here for this stupidity which was no doubt was motivated by the usual selfishness and greed. First there would be the easier road maintenance factor. That's a given. But also, in that South Fork River Basin flood plain valley is an Acquaduct dam syphon which channels water or at least it did down to Hemet Valley Reserviors which served a massive agricultural interests in the valley below. Today it serves a sprawling urban population. I don't think most folks know about this story or it's history. Certainly the Forestry must know of it but have thus far kept their collective mouths shut. Of course out of sight out of mind. But now hundreds of others of you know of that un-natural disaster tragedy of Human making. Any of you now can verify this by visitng and observing with your own eyes what I've just related to you all. It will be beneficial for you to go to Google Earth, type in the coordinance of the Hwy Route 74 & South Fork Hiking Trail and magnify it until you can place the yellow man figure at that turnout. Then pan around with the camera feature and notice the exact Cal-Trans spot with the trees on the opposite side of the road. They are still there because I just looked. You can also drive the little virtual car feature so to speak further east if you know how to work Google's system and you will come to a road sign which says Elevation 4000'. This is the location where the road passes over the Arroyo (I don't even know if it has a name) which has been dammed with only a small culvert to allow the smaller amount of runoff through it. Sadly it's technically no longer a creek. Pan up over to the right and you will notice a burned area where some idiot back in the late 1990s start a fire which burned all the way to Lake Hemet via Baldy Mountain. Incredibly one of the US Fire bosses in charge commented that they were wanting to control burn that heavily dense area anyway and glad it finally happened. Seriously that's what came out of his mouth!!! Anyway, if you know what to look for, you can also Satellite image and pan over to where that landlside scar stands out like a sore thumb. But just to emphasize, this geology needs this cooperative symbiotic relationship of Chamise & Bio-Crust on those foothill slopes or the entire mountain system collapses. Well okay - back to the original subject again. Here's how some examples of ways that plants can benefit from biological soil crusts. 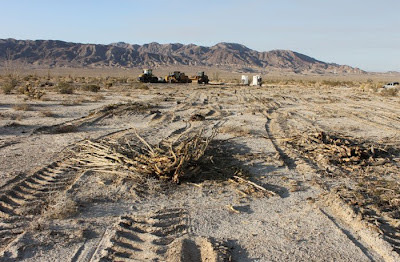 Recent Mojave Desert bio-crust damaging activity by Solar & Wind Energy Farms which have caused irreparable damage to the ground and now creating massive dust storms which the biological soil crusts kept in check. It may take hundreds of years to restore itself. Below Pattern Wind Energy has already begun ripping up desert habitat south of Anza-Borrego Desert State Park for the Ocotillo Wind energy facility after the Department of Interior approved the project in May. 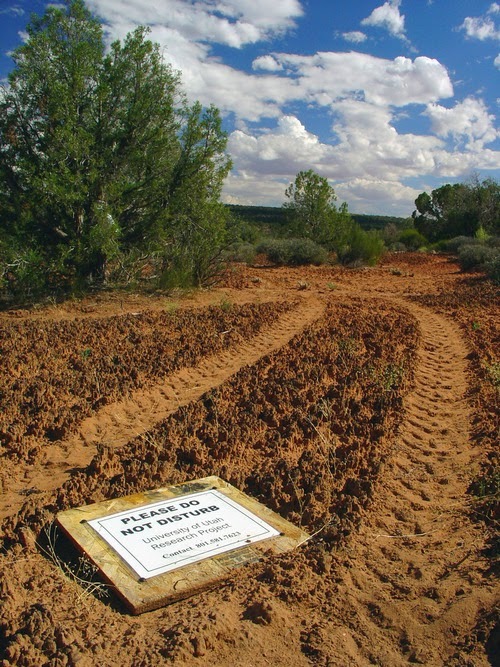 Barbed-wire fences installed to keep citizens and wildlife off what used to be public land. 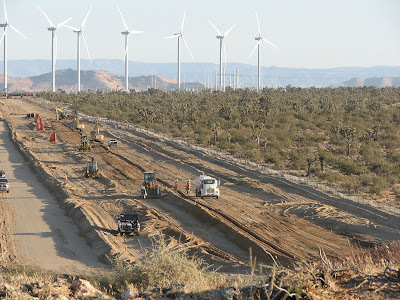 Image from MyDesert.com "Tour of First Solar's Desert Sunlight Solar Farm" video. In conclusion I'll stop here and later show practical applications for not only dune stabilization, but actual possible strategies for turning unproductive heavily eroded badlands into desert Oasis. At the very least, teaching folks in places like Pakistan (Above example) or Africa how to turn things around. Of course like everything, this is not a simple matter of a materialistic Fix-it pill solution. People's attitudes have to change otherwise the knowledge and techniques are worthless since it was mostly piss-poor attitudes which ruined everything & got our planet Earth where it is today in the beginning.